The San Diego Zoo in Balboa Park is one of the cities biggest attractions, welcoming over five million visitors a year to explore its 100 acres of exhibits and habits that are home to over 3,700 different animals. It's known as one of the best zoos in the country for its outstanding conservation program, friendly staff, and the wide variety of over 700 unique species and subspecies it cares for. If you're planning a trip to San Diego and looking for a great way to spend the day outdoors, a visit to the San Diego Zoo is perfect for the whole family (or by yourself). From taking guided tours to witnessing animal shows and encounters, there's plenty to do inside the zoo no matter what time of year you visit. However, the zoo can also get quite crowded, especially in the summer, and additional attractions and entertainment can be expensive. Fortunately, there are several ways you can save time and money on your trip if you know when to go, what to do, and how to get discounts on admission and extra attractions. 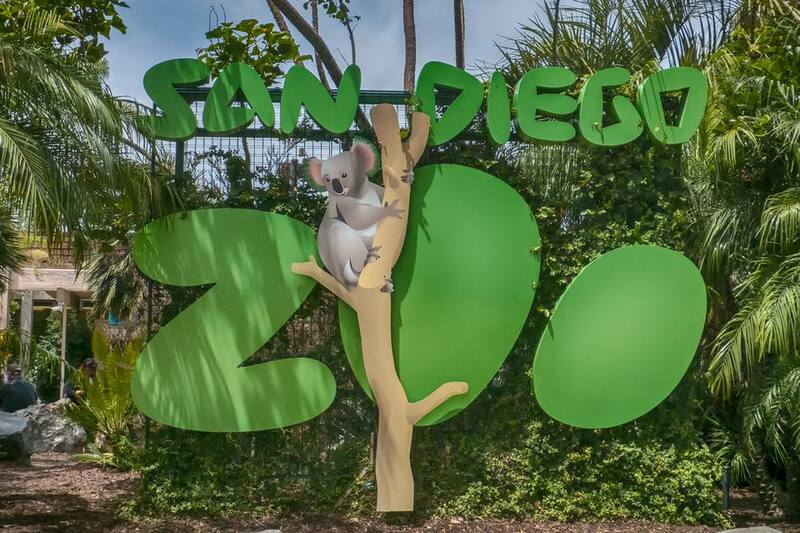 Although there are several ways to get tickets to the San Diego Zoo, the easiest and most convenient method is to purchase them at the ticket booth at the zoo's entrance, which means you'll pay full price and may have to wait in line—especially on busy days. However, your admission fee is a vital part of how the zoo funds its wildlife conservations activities, which means you can feel good about spending a little extra at the gate. On the other hand, if you are organized ahead of time—and especially if you're planning on visiting other San Diego attractions like the Safari Park—you can save some money by buying combination passes; applying discounts for being a senior citizen, military personnel, or AAA member; or finding coupons online through sites like RetailMeNot and Groupon. Discount programs can save you anywhere from 10 to 25 percent of your price of admission. The San Diego Zoo is organized into multiple animal areas connected by themed trails, some of which are wheelchair accessible and all of which are marked with their distance, time, and level of difficulty to navigate. You won't want to miss Scripps Aviary, the Polar Bear Plunge, the Panda Trek, Tiger River, the underwater view of the hippopotamus pond, the Elephant Odyssey, and the Australian Outback trails and sections of the zoo. However, there is also more to do than just walking around looking at the animals. You can also take a half-hour guided bus tour of the zoo featuring expert commentary of zoo employees to get an overview of the zoo's layout and get a little background on the animals that live there. Additionally, 4-D movie experiences and animal shows hosted by zookeepers can be informative and entertaining, and while they may come with an extra price tag, special Animal Encounters allow park guests to get up close and personal with many of the zoo's most popular creatures. Also, the San Diego Zoo is a botanical garden with more than 6,500 plant species, some of which are even more exotic than the animals. The zoo also sponsors some exciting special programs, which change seasonally. Their sleepovers are particularly fun and include a tent to sleep in, dinner, evening snack, and a hot breakfast. Check their website to see what's happening when you are visiting, and make sure to book your tickets well in advance as special events are likely to sell out. 2015 Betsy Malloy Photography. Used by Permission. It takes about three to four hours, at a minimum, to see the entirety of the zoo, but you could easily spend an entire day exploring the many entertainment options, trails, and exhibits. As a result, it is not feasible to visit the Safari Park on the same day you go to the zoo since it's approximately an hour away and takes six hours to see just a portion of this much larger park. When you arrive, take a minute to look at the big billboard near the entry area. It will tell you what exhibits are closed for the day, and it gives the schedules for other activities. Additionally, the zoo layout is complicated, so you should take the opportunity to view a large version of the map to plan out your course. If you're going early, you can get there a few minutes before opening time to be at the gate as soon as the zoo opens, which means you'll beat some of the crowds and might get a chance to see the zookeepers finishing up their daily animal feedings. Conversely, the entrance gate closes two hours before the day's stated closing time, so don't dash up at the last minute hoping to get into the zoo. For the safety of the animals, pets are not allowed, and the zoo doesn't have kennels to house your four-legged friend while you enjoy it. If you're traveling with a pet, you will need to find a local kennel or ask your hotel if you can leave your animal in your room during the day. Unfortunately, food and drinks at the San Diego Zoo can be rather expensive, so if you're looking to save money on your trip, you may want to pack your own lunch. This is especially true if you have food allergies because the zoo says their kitchens are not equipped to prepare food separately or keep allergy-inducing ingredients away from things they cook. Additionally, although the zoo allows guests to bring in food items and water bottles, coolers and other large containers are not allowed. Luckily, there is a picnic area outside the zoo that does allow you to bring coolers, and guests can get stamped at the gate for same-day re-entry to the park. The weather in San Diego is typically hot and sunny most of the year, so you should bring a hat and plenty of sunscreen. While the zoo's many shady paths and indoor exhibits can help you stay cool during your trip, most of the attractions are outdoors in direct sunlight, so be sure to drink plenty of water and take breaks often—especially if you feel like you're overheating. The zoo is also hilly and quite large (at 100 acres), and if you walk every trail, it will take at least three and a half hours, so choose your footwear carefully. During hot weather, get there early or go in the late afternoon and take advantage of later closing times during the summer. Visiting it with children presents some extra challenges, especially when it comes to making sure you visit everything your family wants to experience. As a result, you should set priorities before you go by making a list of all the animals you and your kids want to visit, then plan out your route using online maps of the park. Stop by the Children's Zoo, too, which has a lot of animals that you can't see anywhere else in the zoo. When traveling around the zoo with your kids, you should walk as much as you can to begin your day; then, after you start getting tired, you can use the Skyfari tram and the Kangaroo Express bus to get around. Be sure to hold onto your entry ticket as both of these transit options require guests to show them when boarding. If you're traveling with smaller children, all the walkways at the zoo are easily navigated with a double-wide stroller; however, you can't take these large strollers on the Skyfari tram. Even if your child generally walks, the zoo can be exhausting; bring your stroller—-or rent one at the park—even if you think you'll be pushing it around empty all day. Additionally, diaper changing stations are available in most restrooms; for nursing mothers, the First Aid office next to the Reptile House has a private area and a microwave for warming up bottles and baby food. The San Diego Zoo is located in Balboa Park at 2920 Zoo Drive in San Diego, California, and the easiest way to get there is by driving. If you're having trouble finding a parking spot, there's valet parking near the gate on busy days. After a long day, it's easy to forget whether you parked near the ostrich or the elephant or some other creature you don't recognize, so write down the location where you parked or take a picture of the nearest sign. If you can't drive or don't want to, you can take the Number 7 city bus, which stops at the Zoo, as does the Old Town Trolley Tours bus service. The San Diego Trolley (the one that runs on tracks) goes through downtown and Old Town but doesn't go to the zoo. You should avoid local tour companies who offer ticket/transportation packages. They can cost significantly more than the full ticket price with no chance for discounts, and your time is limited. In fact, you may find a car rental less expensive that booking one of these trips. As is common in the travel industry, the writer was provided with complimentary tickets for the purpose of review. While it has not influenced this review, tripsavvy.com believes in full disclosure of all potential conflicts of interest.